Added Ltd to their mark in 1926. Known to have produced "Asiatic Pheasants" not only in blue but also light brown and possibly other colours as well. 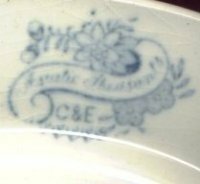 Became part of Alfred Clough Ltd from 1955.
but attribution of "Asiatic Pheasants" wares to Cork & Edge may be more wishful thinking than accurate.